Shop all forms of motorsports here at Off-Road Styles. When it comes to off-road apparel, Off-Road styles knows off-roading best. No one does it better than Off-Road Styles. We specialize in all forms off-road lifestyles. We know what off-roaders want, and we provide them with quality designs and products. 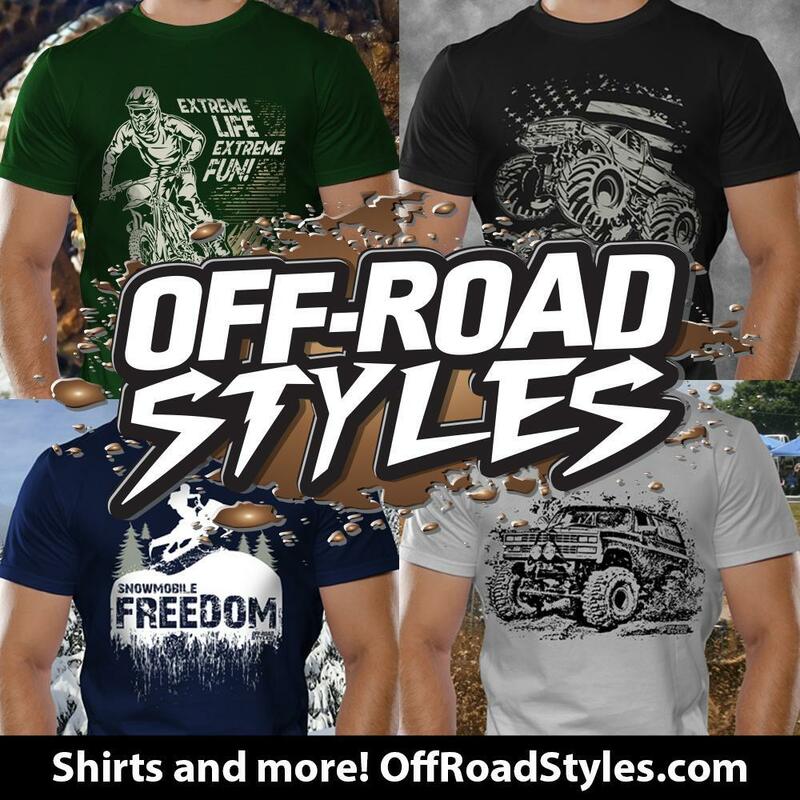 Our off-road t-shirts represent the enjoyment we all feel when we are doing freestyle dirt bike tricks, mud truck racing, monster truck driving, quad stunts, buggy racing, or detailing off-road vehicles. It is the embodiment of our escape from our normal daily lives that offroad activities provide. Off-Road Styles tries its best to show the exciting world of off-roading to the people across the globe. Our designs and products reflect the thrilling nature of offroad adventures. You’ll feel the bumps, the mud, and the rocks through our off-road clothing and gears. We strive to be the go-to brand when it comes to offroad shirts and off-road racing gear. It doesn’t matter if you are a stunt dirt biker, monster jam fanatic, one of the 4×4 truck lovers, ATV riders, UTV riders, lawnmower racer or off-road go-kart racing driver, we have products that will fit your style. Our pickup truck, ATV, Utility Terrain Vehicle, rock buggies, snowmobile and dirt bike shirts are perfect for the weekend warriors who enjoy offroading. They are comfortable, stylish and fun. They are the ideal shirt when meeting up with friends or heading to the trail for a club run. The designs demonstrate the enjoyment of engaging in off-road activities. We are proud of our shirt designs as much as off-roaders are of their rigs. That’s the reason why we make sure that our off-road products represent the fun of riding the unpaved roads. It is our way to raising awareness of our passion and hopefully lure others into it. Off-Road Styles is made by off-roaders for off-roaders. Check out our Design Page and browse the various designs for off-road vehicles shirts. The designs are categorized based on the type of vehicle. Our off-road designs will never go out of style. Aside from shirts, customers can also choose to have the design printed on other clothing items like hats, and sweatshirts. We have a wide range of colors to choose from. We also provide other products aside from off-road apparel. We offer buttons, key chains, mugs, clocks, hats, posters, and iPhone decorations.